If you want to experience a high-quality full-size SUV, then you should consider the 2018 Ford Expedition. The 2018 model comes packed with numerous features that make it a popular option for those in the market for a full-size SUV. 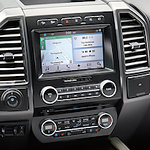 To learn more about the 2018 Ford Expedition, read this summary of a few of its capability features. The 2018 model comes with an available Terrain Management System. This is ideal for those who enjoy off-roading, and it provides you with seven drive modes, such as wet, gravel, or snow, to give you superior traction on any terrain. In addition, the Expedition also comes with best-in-class towing capacity. The 3.5L EcoBoost engine can produce a maximum towing capacity of 9,300 pounds. When you're ready to take the 2018 Ford Expedition for a test drive, visit us at our Ford showroom.